Join the discussion on our forums! 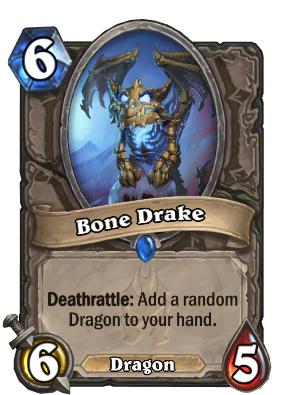 Come discuss Bone Drake over in our dedicated Bone Drake discussion topic. Yo, where Bone Josh at? Deathrattle: add to your hand a Ysera, Deathwing or Primordial Drake. Only if you are playing arena. I have one golden as well & I'm definitely crafting another if I don't open it. I love having all cards that generate other cards in gold. I got a Sindragosa from this earlier which sealed the game for me. Definitely loving running this card in different decks. High value card. One I got a drakonid op off of bone drake, then I discovered my opponent's archbishop benedictus. The memes were immense that game! I ended up beating him with fatigue xD. ...we will have every gold dragon, a must craft. Amazing addition to Dragon Priest, especially since some decks are cutting Lyra the Sunshard, so this is an additional and possibly more reliable way to maintain card advantage. Heck, who's up for the return of N'zoth Priest? With the addition of Obsidian Statue, I think we can expect N'Zoth Priest with a Dragon and Resurrection shell to make a comeback to at least as a Tier 2-ish deck. Considering I did this with Rotface, why not do it with this adorable creature too? So, a 6 mana 6/5 is a somewhat weak body, but it makes up for this in it's effect. The Deathrattle gives you card advantage, and this minion can often trade up due to the aggressive stat distribution. So, it's Deathrattle is pretty huge. It gives you a card that is often going to be good. This card is another technical infinite card and a superb drop from Shallow Gravedigger. Standard Dragons: Itself, Faerie Dragon, Midnight and Twilight Drake, Book Wyrm, Scaled Nightmare, Primordial Drake, Malygos, Nozdormu, Ysera, Onyxia, Alex, Deathwing: Gone Cataclysm, and Deathwing: Gone Dragons. Wild Dragons: Itself, Coldarra Drake, Dragon Consort, Twilight Whelp, Dragonkin Sorcerer, Hungry Dragon, Twilight Guardian, Azure Drake, Drakonid Crusher, Chillmaw, Chromaggus, Faerie Dragon, Midnight and Twilight Drake, Book Wyrm, Scaled Nightmare, Primordial Drake, Malygos, Nozdormu, Ysera, Onyxia, Alex, Deathwing: Gone Cataclysm, and Deathwing: Gone WILD. Final Score: Very Good, will certainly see play. Great Arena card too. I'll definitely try out 1 copy in n'zoth warrior, I think it will fit right in. The deck needs a big guy like this to get revived and mountainfire armor is just the cherry on top. As cool as it looks, it might not make it into dragon priest (standard), the current dragon priest doesn't have room for this, there is no card you can remove to put this in, the deck already suffers against aggro decks and needs silence, weapon revomal effects. So overall, this is a very good card. You will be more likely to run it in a dragon deck though considering that you will be more likely to guarantee value. But, it is not bad in non-dragon decks either since you are slightly above 50/50 of getting a card you could see as useful. Arena will also enjoy this card immensely as it is in the rare tier and can obtain you higher value cards.